Those listed "subtitled version only" are truly horrendous in English. What English dubbing does to anime? Imagine the powerful and eloquent voice of James Earl Jones replaced by hack actor Pauly Shore. In the past, I would choose the English dubbed version when watching anime. However, I became completely turned off by the English voice overs in Saiyuki. Saiyuki had mediocre acting and a mediocre script. I opted to listen to the Japanese dialog and read the subtitling. It was difficult getting used to a foreign language but the acting was much better. In fact, I've been listening to anime in Japanese ever since that day. However, my favorite English voice actor is Beau Billingslea (voice of Jet Black, Cowboy Bebop). 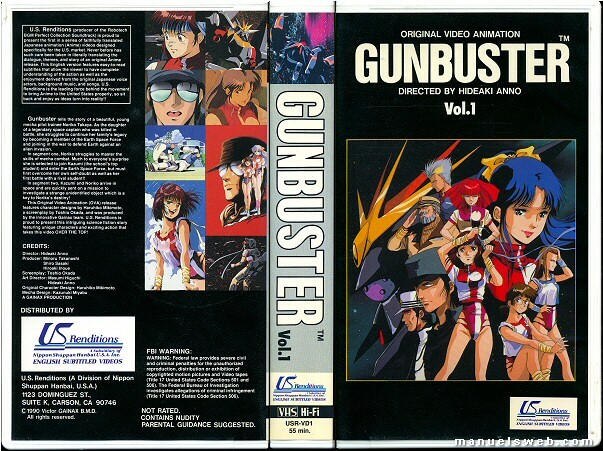 All-time favorite: GunBuster -- I consider this my first anime. When I first saw it I thought, "This is a cartoon?" I had never seen animation with such realism. Just the way they drew the sky or sunset on the beach was like a painting*. Even the cockpit scenes had so much detail (easier done today by CGI). Plus the story was filled with drama. After watching anime my childhood seems somehow deprived. Another facet of anime is music. Some anime have very catchy themes. I've made a habit of recording my favorite themes and listening to them on my PC. I love the ending theme My Will to Inu-yasha by Dream. If you've seen R.O.D TV then you've heard the ending theme Moments in the Sun by Kazami, another of my favorites. Here is a download of my favorite anime songs (927KB). This link contains the titles in order played with links to buy from Amazon. I'm trying to learn Japanese on my own to understand the anime I watch. I made flashcards to learn kana. *Gunbuster makes perfect use of cell animation. Jonathan Clements, co-author of Anime Encyclopedia, refers to this as "really good cases of sky."